Research at PNNL’s Lab Homes helped to bolster an energy-efficiency designation for heat pump water heaters. Heat pump water heaters offer the average household up to 63 percent reduction—and about $239 per year—in water heating energy consumption. But yet, the energy industry has long been concerned about the energy efficiency of heat pump water heaters—in particular, the impacts of cool air exhausted by these systems on home heating and cooling loads. While these products have been in the market for several years, earlier this year the Pacific Northwest Regional Technical Forum (RTF) accepted heat pump water heaters as a fully reliable, proven energy-efficiency measure. This determination was made, in part, due to research conducted at PNNL’s Lab Homes, where a research team answered questions about heat pump water heaters and whole home energy efficiency. With this new designation, utilities within the Bonneville Power Administration’s territory and across the country are now able to make more sound financial determinations when incentivizing customers to install and use these water heaters. Hot water is essential for human comfort—think bathing, clean clothes, and sparkling dishes. But such comfort comes at a cost, with water heating representing approximately 18 percent of residential energy consumption annually. Heat pump water heaters use electricity to move heat from one place to another instead of generating heat directly. Much like a refrigerator in reverse, these systems pull heat from surrounding air into the tank to heat the water. However, they exhaust cool air, and that caused concern about the air’s impact on home heating and cooling systems. Supported by the Northwest Energy Efficiency Alliance (NEEA), PNNL researchers set out to determine if heat pump water heaters and home heating and cooling loads impacted one another. Their study used a combination of theoretical analysis, review of previous literature, and an experimental assessment. 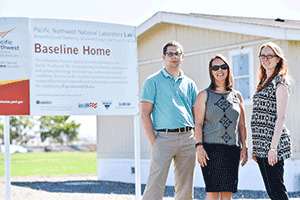 The experimental assessment involved use of PNNL’s Lab Homes, which are funded in part by the DOE Office of Energy Efficiency and Renewable Energy. These side-by-side factory-built homes allow researchers to assess energy-saving and grid-responsive technologies in a controlled environment. Each 1500-square-foot home mimics many of our own homes—with three bedrooms and two bathrooms, an electric forced-air furnace controlled by a single thermostat, and double-pane clear glass windows. One home acts as a control home that contains the “typical” comparable technology that would be in most homes across the country—in this case, an electric resistance water heater. The second home, the experimental home, is equipped with the newer technology—in this case, the heat pump water heater. The resulting difference in energy use then helps represent the whole home energy savings associated with the newer technology. All of the relevant parameters were kept the same between the two homes, including set point temperature, whole-house set point temperature, and hose length to and from the water heater. The team’s goal was to determine the impact on heating and cooling energy use when a heat pump water heater is installed in different representative locations around the house. The water heaters were configured to be moveable via a dolly from one space to another at various orientations from the thermostat. The experiments provided definitive evidence that, the further the heat pump water heater was placed from the thermostat, the less the heat the space conditioning system had to make up. This finding has led to industry best practices for installing these systems and reducing their impact to home energy consumption while maintaining occupant comfort. “These results helped to provide the RTF with enough confidence to vote that the heat pump water heaters are approved as an energy efficiency measure by proving that the interactions between the water heating and space heating systems are typically not as intertwined as we once thought, unless the water heater is installed very close to the thermostat,” said PNNL engineer Cheryn Metzger, who led the study. The team’s report, “Interaction between Heat Pump Water Heaters or Other Internal Point Source Loads and a Central Heating System,” is available on NEEA’s website. PNNL Research Team: Cheryn Metzger, Joshua McIntosh, along with former staff members Sarah Widder and Joe Petersen.